Normally, NETCONVERT and NETGENERATE generate traffic lights and programs for junctions during the computation of the networks. Still, these computed programs quite often differ from those found in reality. To feed the simulation with real traffic light programs, it is possible to run SUMO/SUMO-GUI with additional program definitions. Also, SUMO/SUMO-GUI allow loading definitions which describe when and how a set of traffic lights can switch from one program to another. Both will be discussed in the following subchapters. Another possiblity is to edit traffic light plans visually in NETEDIT. All traffic lights are generated with a fixed cycle and a default cycle time of 90s. This can be changed with the option --tls.cycle.time. If the speeds at the intersection are below the threshold of 70km/h (configurable via option tls.minor-left.max-speed), left-turns are allowed at the same time as oncoming straight traffic but have to yield. This is called green minor and indicated with a lower-case g in the state definition. Otherwise, the left-turning stream must use a protected left-turn phase (see below). If no such phase can be built because there is no dedicated turning lane, green minor is allowed anyway but a warning is issued. If a green phase allows for partially conflicting streams (i.e. straight going and left-turning from the opposite direction) and there is a dedicated turning lane, it is succeeded by another green phase with full priority to the partially conflicted streams (this would typically be a left-turning phase). The duration of this phase defaults to 6s and can be customized (or disabled) by setting the option --tls.left-green.time. In reality there are often phases where all streams have red to allow clearing an intersection. SUMO does not build these phases by default. To have each green phase preceded by an all-red phase, the option --tls.allred.time can be used. It is also possible to generate #Actuated_Traffic_Lights by setting the option --tls.default-type actuated. This will generated the same signal plans as above but with green phases that have a variable length of 5s-50s (both values can be set using the options --tls.min-dur, --tls.max-dur). The generated phase layout can be selected setting option --tls.layout to opposites (default) or incoming. Due to the default timings explained above, the green phases usually have a duration of 31s. If the node type is set to traffic_light_right_on_red rather than traffic_light, then right turns from all sides are permitted in all phases (after coming to a stop before entering the traffic stream that currently has the green light. If the roads meeting at an intersection have the highest road priorities on a turning stream, then layout incoming may be generated instead of layout opposites. If a traffic-light junction does not have any conflicting roads (i.e. it models a pedestrian crossing) it will not get a red phase by default. A single red phase may be generated by setting the option --tls.red.time. The tool tlsCycleAdaptation.py can be used to modify green phase durations to accommodate a given traffic demand. The tool tlsCoordinator.py can be used to modify program offsets to generated green waves for a given traffic demand. id id (string) The id of the traffic light. This must be an existing traffic light id in the .net.xml file. Typically the id for a traffic light is identical with the junction id. The name may be obtained by right-clicking the red/green bars in front of a controlled intersection. programID id (string) The id of the traffic light program; This must be a new program name for the traffic light id. Please note that "off" is reserved, see below. minDur time (int) The minimum duration of the phase when using type actuated. Optional, defaults to duration. maxDur time (int) The maximum duration of the phase when using type actuated. Optional, defaults to duration. name string An optional description for the phase. This can be used to establish the correspondence between SUMO-phase-indexing and traffic engineering phase names. next index (int) The next phase in the cycle after the current. This is useful when adding extra transition phases to a traffic light plan which are not part of every cycle. In a SUMO-TLS definition, time is on the vertical axis and each phase describes all signal states that last for a fixed duration. This differs from typical traffic engineering diagrams where time is on the horizontal axis and each row describes the states for one signal. Another crucial difference is, that in SUMO a new phase is introduced whenever at least one signal changes its state. This means that transitions between green phases can be made up of multiple intermediate phases. Each character within a phase's state describes the state of one signal of the traffic light. Please note, that a single lane may contain several signals - for example one for vehicles turning left and one for vehicles which move straight. This means that a signal does not control lanes, but links - each connecting a lane which is incoming into a junction and one which is outgoing from this junction. In SUMO, a one-to-n dependency between signals and links is implemented, this means each signal may control more than a single link - though networks generated by NETCONVERT or NETGENERATE usually use one signal per link. Please note also, that a traffic light may control lanes incoming into different junctions. The information about which link is controlled by which traffic light signal may be obtained using the "show link tls index" option within SUMO-GUI's visualisation settings or from the according linkIndex attribute of the <connection> elements in the .net.xml file. s FOO 'green right-turn arrow' requires stopping - vehicles may pass the junction if no vehicle uses a higher priorised foe stream. They always stop before passing. This is only generated for junction type traffic_light_right_on_red. Example: traffic light with the current state "GrGr". The leftmost letter "G" encodes the green light for link 0, followed by red for link 1, green for link 2 and red for link 3. The link numbers are enabled via SUMO-GUI settings by activating show link tls index. For traffic lights that control a single intersection, the default indices generated generated by NETCONVERT are numbered in a clockwise pattern starting with 0 at 12 o'clock with right-turns ordered before straight connections and left turns. Pedestrian crossings are always assigned at the very end, also in a clockwise manner. If traffic lights are joined so that a single program controls multiple intersections, the ordering for each intersection stays the same but the indices are increased according the order of the controlled junctions in the input file. In the sumo-gui you can click on a red/green stop bar and select show phases. SUMO supports gap-based actuated traffic control This control scheme is common in Germany and works by prolonging traffic phases whenever a continuous stream of traffic is detected. It switches to the next phase after detecting a sufficient time gap between sucessive vehicles. This allows for better distribution of green-time among phases and also affects cycle duration in response to dynamic traffic conditions. The value of max-gap describes the maximum time gap between successive vehicle that will cause the current phase to be prolonged (within limits). detector-gap determines the time distance between the (automatially generated) detector and the stop line in seconds (at each lanes maximum speed). If show-detectors is set to true, the generated detectors are shown in SUMO-GUI. The parameters file and freq have the same meaning as for regular induction loop detectors. The examples values are the default values for these parameters. Here, the detectorRange specifies the upstream detection range in meters measured from the stop line. Per default (if the parameter is left undefined) the underlying E2 detector is assumed to cover the first approaching lanes completely. The time loss for a vehicle is accumulated as soon as it enters the detector range. If its accumulated time loss exceeds the value of minTimeLoss (current default is one second) seconds a prolongation of the corresponding green phase is requested if it is active. The instantaneous time loss of a vehicle is defined as 1 - v/v_max, where v is its current velocity and v_max the allowed maximal velocity. See [Oertel, Robert, and Peter Wagner. "Delay-time actuated traffic signal control for an isolated intersection." Transportation Research Board 2011 (90th Annual Meeting). 2011.] for details. Every traffic light intersection has the right-of-way rules of a priority intersection underneath of it. This becomes obvious when switching a traffic light off (either in SUMO-GUI with a right-click on the traffic light or by loading the "off" program). 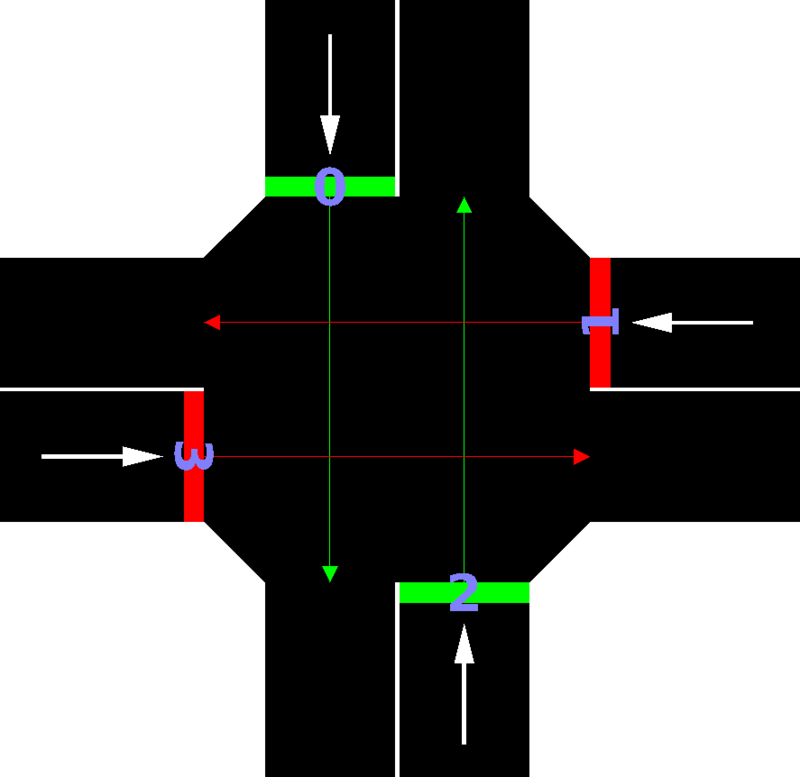 The right-of-way rules of this priority intersection come into play when defining signal plans with simultaneous conflicting green streams (by using g and G states). These signal plans only work correctly if the right-of-way rules force vehicles from the g stream to yield to the G stream. In most cases, this relationship was set correctly by the default signal plan. However, when introducing new g/G relationships, correctness is only ensured by loading the network and the new signal plan into NETCONVERT and thus updating the right-of-way rules. After having defined a tls program as above, it can be loaded as an additional-file; of course, a single additional-file may contain several programs. It is possible to load several programs for a single tls into the simulation. The program loaded last will be used (unless not defined differently using a WAUT description). All subkeys of the additional programs must differ if they describe the same tls. It is also possible to load a program which switches the tls off by giving the programID the value "off". Description from real-world traffic light systems do not arrive in form of SUMO-traffic light descriptions normally. The main difference in presentation comes from the fact that SUMO defines a new <phase> whenever any of the controlled signals changes its state, whereas traffic engineers differentiate between phases and phase transitions. For an easier import than editing the XML by hand, some tools exists in <SUMO_HOME>/tools/tls. tls_csv2SUMO.py: this tool simplifies descriptions because it allows to define the duration of phases for each controlled edge-to-edge connection. Splitting into smaller SUMO-phases because other signals change is done automatically. tls_csvSignalGroup.py: this tool further simplifies descriptions because it allows to define the start and end times of green-phases per signal group (up to 2 green phases, actually) and the transitions (yellow, red-yellow) are added automatically. The splitting into smaller SUMO-phases is also done automatically. Alternatively NETEDIT can be used to edit programs using a graphical user interface. Setting the option --tls.join when building the network with NETCONVERT. This will automatically join the traffic lights of nodes in close proximity within a default distance of 20m (customizable by setting option tls.join-dist <FLOAT>). Note, that in this case the state vector for each phase will be as long as the total number of controlled intersections. Also, the tls indices for the connections will differ from the link indices (as the latter starts with 0 for each intersection whereas the tls indices are unique within a controller). The generated TLS program will attempt to identify the main directions but usually this needs some manual corrections. In SUMO every lane-to-lane connection at a controlled intersection is assigned an index called link tls index. This index is used to determine the state for each phase by looking up the character code at that index in the state vector. The link index can be shown in SUMO-GUI by setting the junction visualization option show link tls index. By default link indices are unique for each connection and assigned in a clockwise manner starting at the north (the same as the junction link index which is used for defining right-of-way rules). When defining joint TLS, the indices continue their numbering in the order of the controlled junctions. The tls index for each connection can be freely assigned in a .tll.file or by setting attribute linkIndex in NETEDIT. By assigning the same index to multiple connection they form a signal group and always show the same state (simply because they reference the same state index). This allows shortening and thus simplifying the state vector. In practice, a tls often uses different programs during a day and maybe also for weekdays and for the weekend days. It is possible to load a definition of switch times between the programs using a WAUT (short for "Wochenschaltautomatik" ~ weekly switch automatism). Of course, programs with the used names must be defined before this definition is read. Also, the switch steps must be sorted by their execution time. It is possible to assign several tls to a single WAUT. It is also possible to assign several WAUTs to a single junction in theory, but this is not done in reality. A complete definition within an additional-file is shown below. It would trigger switching between programs S1 and S2 for traffic light logic X with an initial program called 0. Some tools are available which help generating detector definitions for the evaluation of traffic lights. All are located in <SUMO_HOME>/tools/output. The actuated traffic lights do not require detector definitions to be added as they generate their own detectors for internal use. generateTLSE2Detectors.py generates a file which includes areal detectors. All lanes incoming into an intersection are covered with these detectors. The offset from the intersection may be given using the option --distance-to-TLS <FLOAT> (or -d <FLOAT>), the default is .1m. The generated detectors end either after a given length, defined using --detector-length <FLOAT> (or -l <FLOAT>) where the default is 250m, or at the lane's end if the lane is shorter than this length. generateTLSE3Detectors.py generates a file which includes multi-entry/multi-exit detectors. Detectors are built for each edge incoming to the traffic light. All lanes of each of these edges are covered with exit points. These point's offset from the intersection may be given using the option --distance-to-TLS <FLOAT> (or -d <FLOAT>), the default is .1m. The incoming edges are followed upstream, either until a given length, defined using --detector-length <FLOAT> (or -l <FLOAT>) where the default is 250m, or another traffic light is reached or no further upstream edge exists. Entry points are generated at these points. In both cases, the network must be given using the option --net-file <FILE> (or -n <FILE>). The file including the detector definitions to generate may be given using the option --output <FILE> (or -o <FILE>), default is "e2.add.xml" for areal detectors, and "e3.add.xml" for multi-entry/multi-exit detectors. Per default, the areal detectors generated by generateTLSE2Detectors.py are writing their measures to "e2output.xml", the multi-entry/multi-exit detectors generated by generateTLSE2Detectors.py to "e3output.xml". The output file name can be changed for both scripts using the option --results-file <FILE> (or -r <FILE>). The frequency of generated reports is 60s per default. It can be changed using the option --frequency <INT> (or -f <INT>). A common pattern for implementing adaptive control via TraCI is to load a program where all green phases have a long duration (i.e. 1000s) to avoid switching by SUMO and then use the setPhase function to switch to the next phase as appropriate. The nice thing about this approach is, that yellow and all-red phases can still be handled automatically by SUMO and the control script simply determines the duration of the current green phase. To implement controllers with branching phase transitions, the phase attribute next can be used to indicated the next phase. This is useful when adding additional transition phases to the end of a fixed cycle program. Tutorials for controlling traffic lights in this way can be found at Tutorials#TraCI_Tutorials. Using the function setPhaseDuration, the remaining duration for the current phase can be modified. Note, that this does not take effect when encountering the same phase again in the next phase cycle. Another method for controlling the traffic light is to set the signal state for all links directly using the function setRedYellowGreenState. After using this function, SUMO will not modify the state anymore. Consequently, the script must handle all phases and transitions. SUMO can load multiple traffic light programs from the .net.mxl file and from additioal files. Using the traci function setProgram, a script can switch between them.